Arrived at Kyoto Station around 10:00am. Re-built and expanded around a decade ago, that place is HUGE…besides being the main bus, train and Shinkansen (Bullet Train) center for Kyoto, it also encompasses a few shopping malls, a department store, a hotel, the theater where Disney’s Beauty & The Beast was playing, and I forget what else…I mean it’s HUGE. 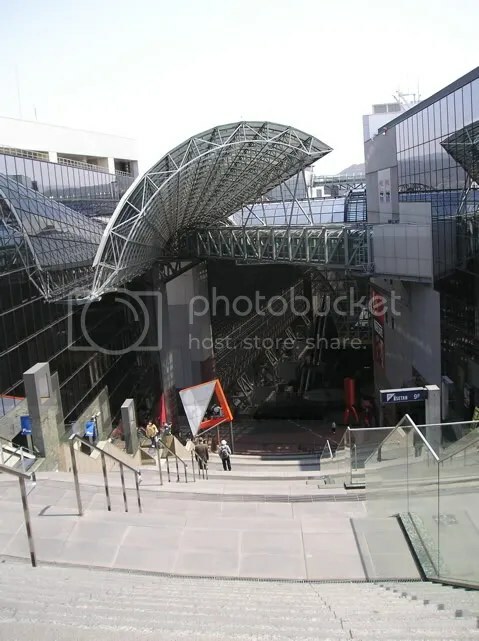 This picture of Kyoto station, which shows how cavernous is it, is only a tiny piece of the whole complex. We wandered around for an hour, getting our bearings and looking for a place to eat. Found a noodle shop that opened at 11am and had a good breakfast/lunch of stuff that we mostly knew what it was (wink). 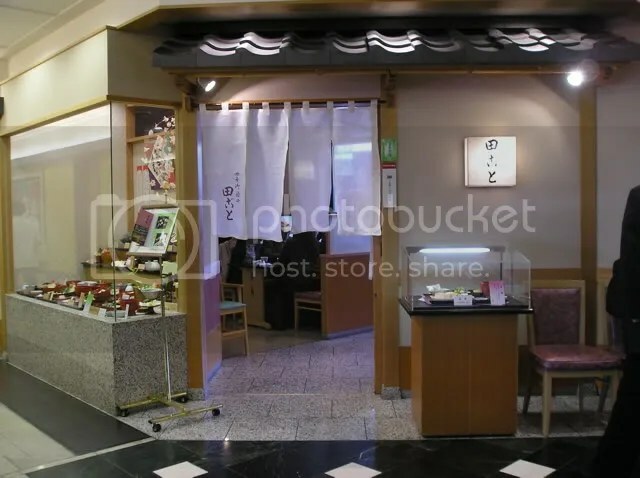 The shop, which was within the confines of Kyoto Station, gets a lot of tourists (and non-tourists too), so one of the workers helped Joe and Steve with what they had to do with their food (“put these spices in this liquid, mix and dip your food into it”…that sort of stuff). I apparently “won” the “Stupid American” contest…the guy only helped me once…told me to pour the broth over my noodles and shrimp and then he left me alone (wink). Front of the noodle shop. Notice the display of plastic food on the left side of the store. 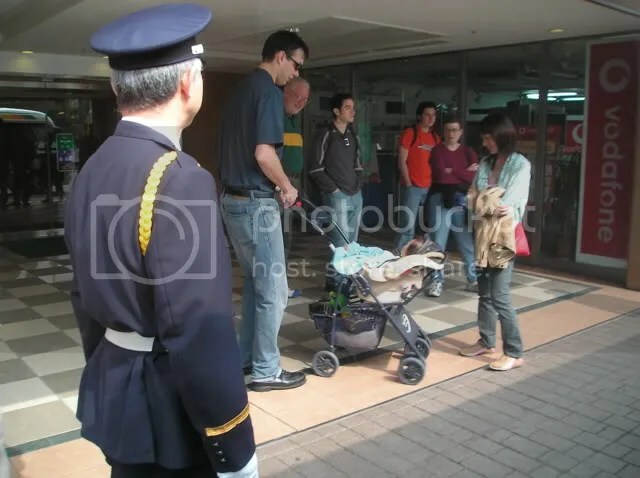 Besides showing potential customers the type of foods they offer, those who don’t speak the language can go outside with the person who is taking your order and you can point to what you want. 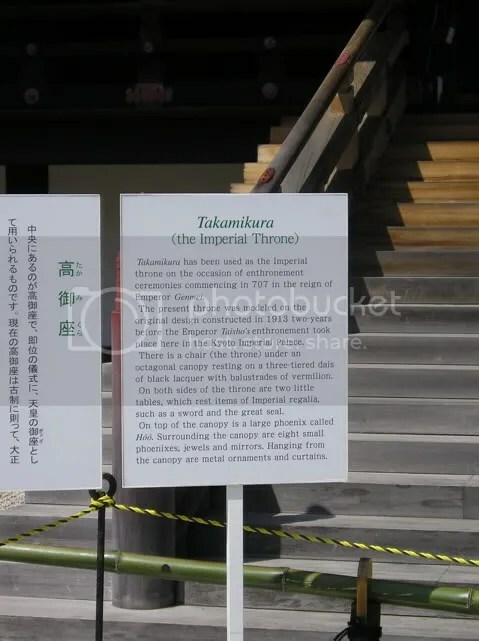 So after several stops at several information booths, we found our train and made it to the Imperial Palace. It’s a group of very big, old buildings inside a park. Actually, it’s much more than that. 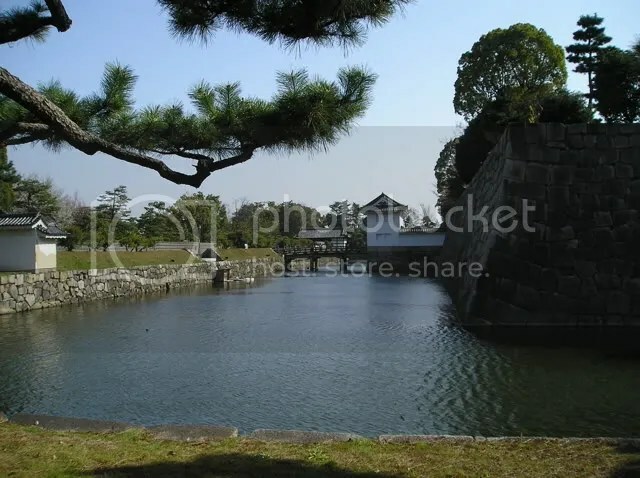 The Japanese Imperial family lived in these buildings before they moved to their Imperial Palace in Tokyo in 1868. 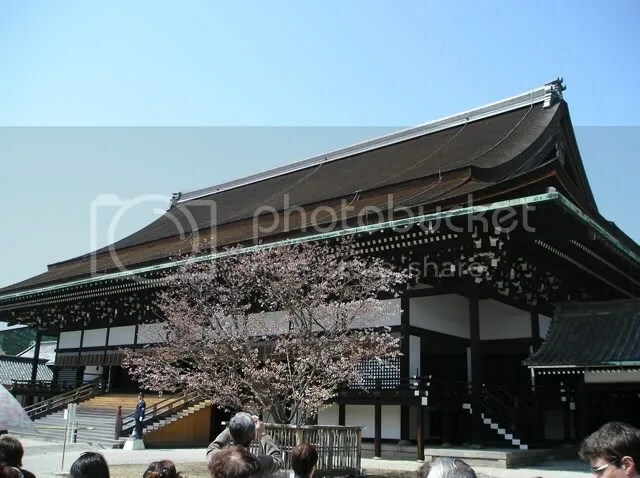 It was built and rebuilt (ten times due to fire) between 750 and 1855 A.D. The do have free guided tours, but you need to apply in person (not by mail or phone) to be able to go on one. That didn’t work for us logistically, since we had just arrived a day and a half before, plus the tours are only conducted in Japanese. We were only allowed to stand outside the buildings and, at best, peer inside. 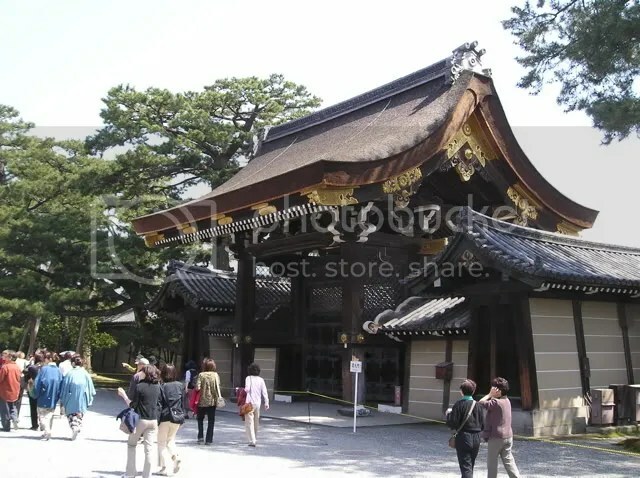 One of the more ornate buildings that is in the Imperial Palace complex. Looks like Epcot, doesn’t it? General description of what we’re seeing in this particular building. Close-up of what was described. And no, that’s not an orb. 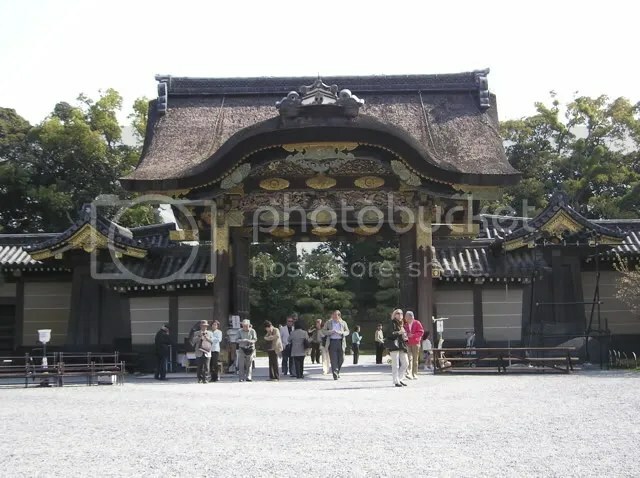 Since we made it to one tourist spot without incident, we decided to take our chances and took another train to Nijo Castle. 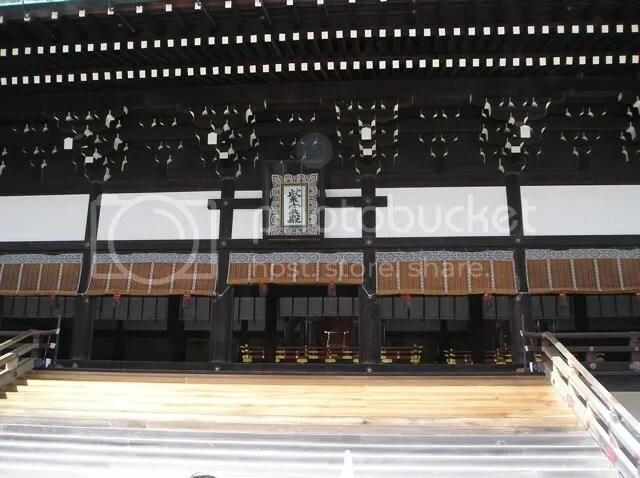 Another “big ol’ opulent house where someone important used to live.” This one began construction in 1601, as a residence for the Shoguns and, like many old Japanese buildings, was burned down and rebuilt many times over the centuries. We were allowed to go inside this one, albeit after taking our shoes off to protect the centuries-old floorboards. 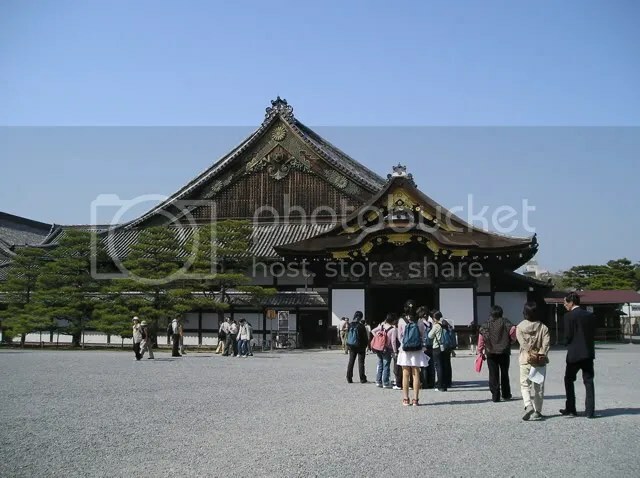 Nijo castle was built in such a way that the floorboards always squeak if someone stands or walks on them…it was done that way on purpose, so guards could hear intruders at nighttime. 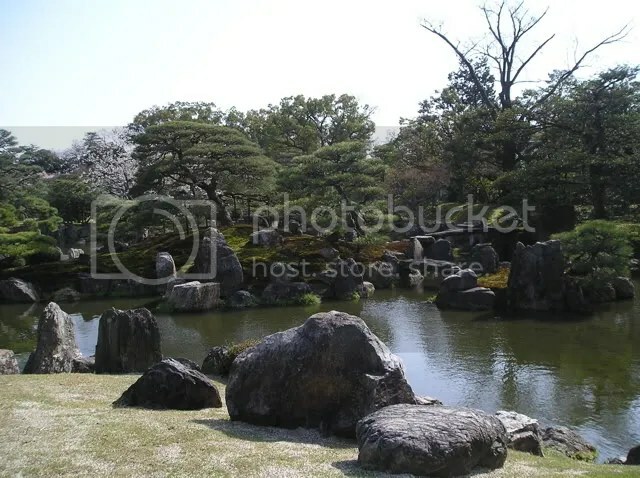 We weren’t allowed to take pictures inside the buildings but took shots of the outside and the gardens. Visitors are allowed to climb the (VERY STEEP!) stairs to just one of the guard gates. This is the view from there. 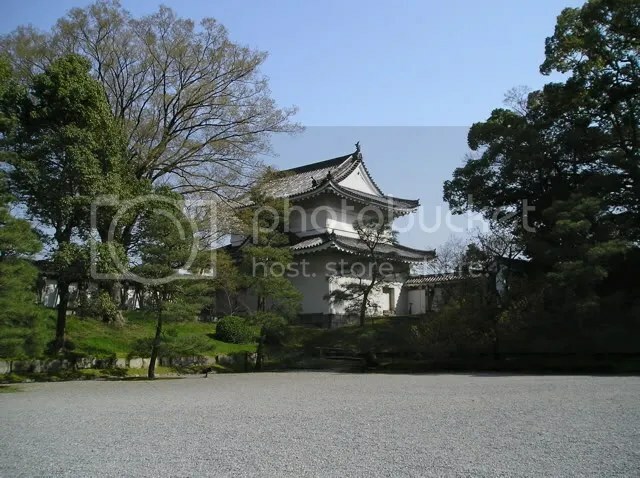 A very photogenic building in the Nijo Castle complex [wink]). 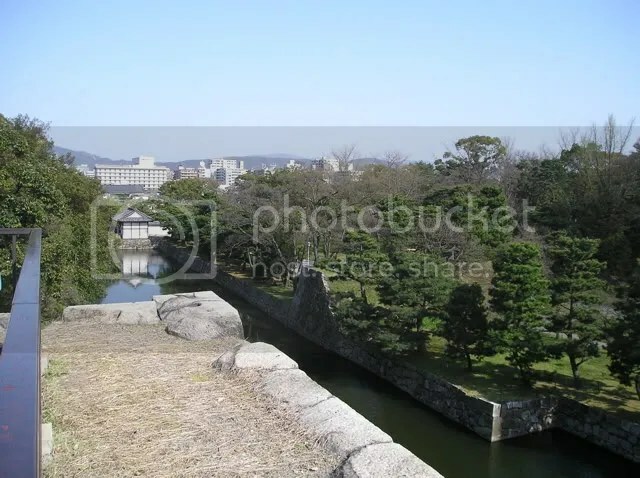 Nice shot of the Nijo Castle garden. By this time it was about 4pm. Beauty & the Beast was scheduled to open their doors at 6:10pm so we trained it back to Kyoto Station and found a sit-down place to eat called Toh Sai. Joe and I both had the pork cutlet in curry with white rice (before we had gone on this vacation, someone told us that when in doubt, get the curry platter) and Steve had a beef dish. Decided to get dessert…Joe and I shared a chocolate parfait, which was chocolate soft-serve ice cream with whipped cream, chocolate syrup and frozen raspberries on top, and a layer of mandarin oranges, pineapple chunks and more frozen raspberries on the bottom. I’ve never been a fan of chocolate and fruit, so all I’ll say is that the ice cream part was good (wink). Made it to B&TB…the show is exactly like the Broadway and/or traveling version, though, of course, all in Japanese (“Ohayo Belle!” instead of “bon jour”). We were able to follow the storyline without a problem though…between the 3 of us, we’ve seen it 20 times between Broadway and the Tampa Bay Performing Arts Center (grin). Posters advertising the show. Photo taken at Kyoto Station. Notice what show is coming next…Aida! 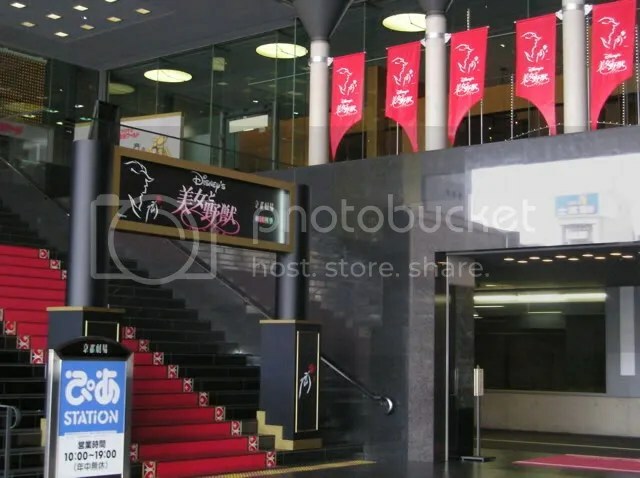 Stairway that leads to the main entrace of the theater. The opening to the right leads towards a hotel that is also in Kyoto Station. 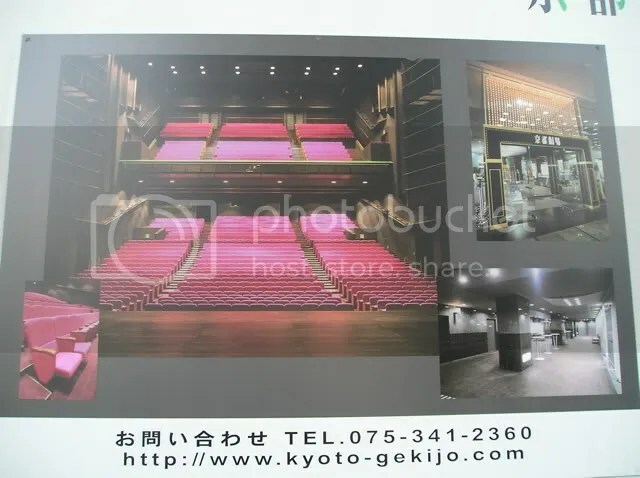 A picture of the inside of the theater. Very plain, undecorated black walls and ceiling, with these BRIGHT pinkish-purple seats. 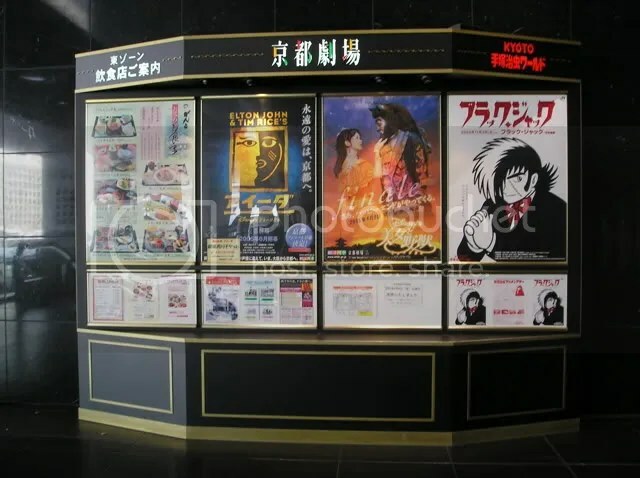 Japanese audiences are very different from American audiences…besides a few nuances that wouldn’t translate over (i.e. when Belle sings the line, “Madame Gaston, his little wife, UGH!! !”, the “Ugh” is MUCH less accentuated in Japan…because people generally just aren’t that mean to each other in Japan where they would say something that bad about someone else [grin]), their applause between songs is polite and short-lived, there was little-to-no laughing at the parts we Americans always laugh (i.e. when Gaston knocks LeFou to the ground), but they clapped for 5 minutes straight, non-stop, for TEN curtain calls at the end of the show! Now, this COULD be because the show was scheduled to close the next night, but even so, it is, by far, the LONGEST applause I’ve EVER seen! 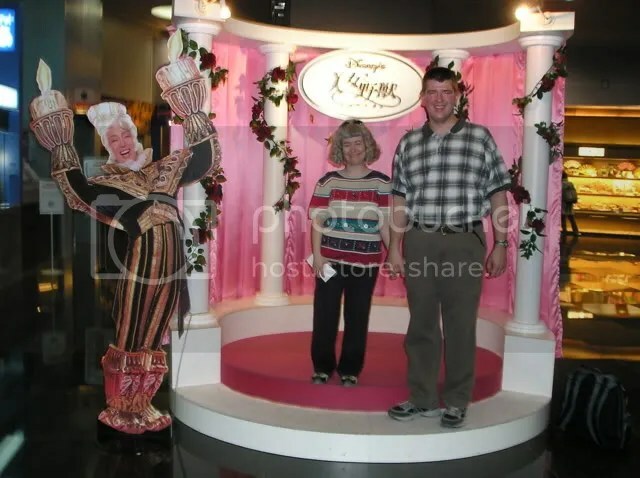 Joe and I and a lifesize cardboard cutout of Lumiere. Overall, we had a very nice time and the only disappointment was that they didn’t have any Japan-specific, or Kyoto-specific B&TB merchandise…all of their shirts, mugs, etc., all had the generic “B&TB: A Broadway Musical” logo. Only thing they had was an ornament for a cell phone that had “Kyoto – Finale!,” to commemerate the closing the show, so we got one of those. I would have bought the CD but, of course, I got that YEARS ago (wink). 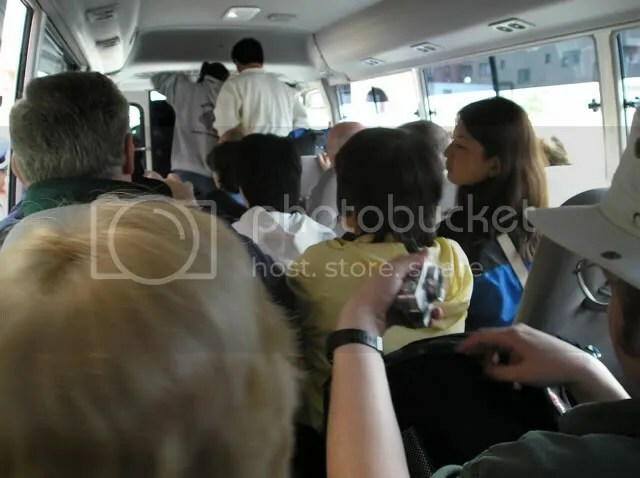 Took a city bus back towards our hotel and amazed ourselves at not getting lost between the bus station and the hotel. Was in bed by 11pm, with plans to meet Steve at 8:30 Saturday morning, to go on our next adventure.